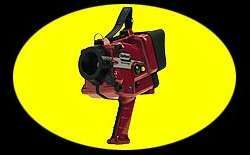 Recently the firefighters obtained an infrared imager to use in fire-rescue and firefighting. This was finally achieved after Lt. Byron struggled with budget available funds and getting a cut rate price. Ladder54 firefighters were the crew that integrated the thermal imaging camera into the Tukwila Fire Department and thus have some images for visitor viewing. All firefighters are excited about infrared technology and, although still very expensive (20 - 30,000 dollars = one camera), it is fast becoming a recognized life saving tool in the firefighting service. 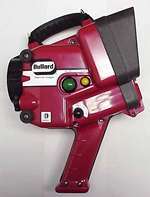 It is one of few tools that come along and make the firefighters job much safer and faster. Here you'll know what we mean and can view actual infrared video footage of firefighting and fires (below) with and without the thermal camera. First off - how does infra-red thermal imaging work? It only reads infra-red heat signatures ( temperature variations down to .05 degrees F ) so no light is required. The camera then places the images on a screen in the form of a video picture. With it one can display not only fires, but heat from people, inside walls, and more! At the right is the light spectrum that the thermal imaging camera uses. CLICK ON THE IMAGE TO SEE WHAT IT WOULD LOOK LIKE WITHOUT THE CAMERA. A simulated "firefighter down" in a building on fire. He was found in a matter of seconds with the thermal imager camera. A infrared still shot of active firefighting from one of the videos you can load below. What a fire victim looks like through the thermal imaging camera. Click on the icon to load the movie (in .mpg format). The movie will download and run in windows media player (or select "run from site"). Remember - the whiter the area is, the hotter it is ( you'll notice the high heat at ceiling level ). Setting media player to VIEW @ 200% is recommended. You'll have to wait while the file to download. If it begins playing too early and over-runs the player,STOP and wait to download more. If Real-Player format is preferred, let us know. Movie is an inside fire attack. The firefighters advance into the main fire room. Movie is a side by side fire attack sequence. It begins without an infrared camera going in the front door of a housefire. After entering the thermal imaging camera will come on. Immediately before the camera infrared image displays you get what firefighters would see (not much). This movie is additional footage of the inside fire attack. Notice the heat levels and the travel of the heat. Right now we don't have a lot of links posted. There are a lot out there though. By going to the Bullard Company site you'll find most of them if you want. If really interested for a fire department we suggest visiting this site. The thermal imager comes with an option that allows it to TRANSMIT the image to a screen ( TV ) outside the fire (ex- to the command car). The transmitter operates in the 2 GhZ band. We have the option in ours and it adds to the various uses of the unit. We hope you've enjoyed learning about the Thermal Imaging ( also termed TI in the business ) Infrared firefighting camera. Please sign our guestbook ! Check back again soon to get new information and actual rescues performed with the TI camera. Documents available here as a download (word docs). Just click the topic! If you'd like to place our page on a website please feel free ( http://www.ladder54.com/thermal.htm ). How does ladder54.com get 10,000 visitors each month?